Last year we got a look at the beautiful BMW i8. This year we get the stunning BMW i8 Spyder Concept, which takes the company’s experimental hybrid lineup and launches it out of the atmosphere. The Tron-esque ride features a two-section folding roof, suicide style doors and some improved and updated looks on both the exterior and interior. The i8 Spyder has a 131 horsepower electric motor driving the front wheels and a 223 hp turbocharged 3-cylinder powering the back. The setup allows the car to offer up front-wheel, rear-wheel or all-wheel drive depending on driver needs while offering up a 78 mpg fuel economy. 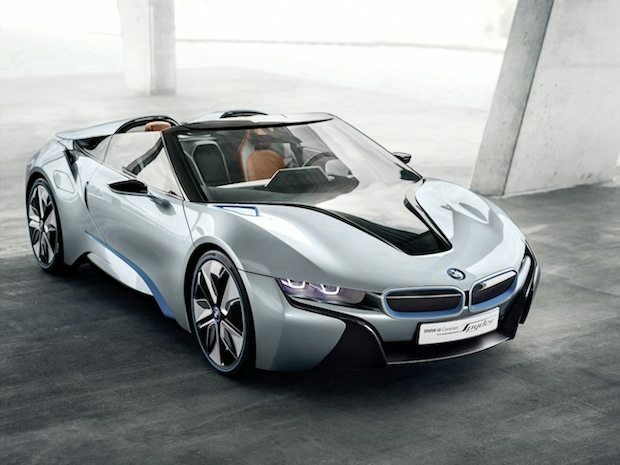 The i8 Spyder features a 50:50 weight distribution, a 0-62 mph time of just 5 seconds and a top speed of 155 mph. If you drive the i8 conservatively you can rely, solely, on its 131 hp electric motor to get you around which it will do happily for 19 miles at a whopping 94 mpg. If you choose to take it up a canyon and whip it through some corners you can kick in the 223 hp three-cylinder coupled to the electric motor which gives you a sweet 354 hp – BMW calls this eDrive.